In fact, we might need to start hanging them on the third floor next year. We started back in 2002, with a low key affair, but 2003 was the first year that we got a banner made, listing the names of our award winners. And the rest, well, it’s history. We gave out 17 Silverstein awards back in 2003 — the first year that we knew we had this wonderful endowment. Since then, well, it’s tough to count all the students who have benefited. 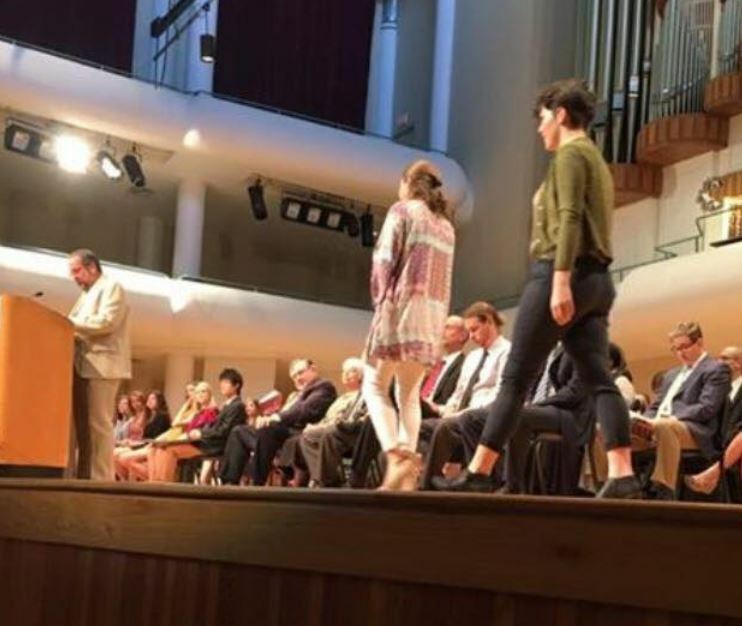 14 more were added to this list today, along with two graduating seniors who shared our annual award for the Outstanding Student in the Academic Study of Religion (namely, Sierra Lawson and Madeleine Lewis, pictured below, coming on stage at the A&S event that takes place in the morning). 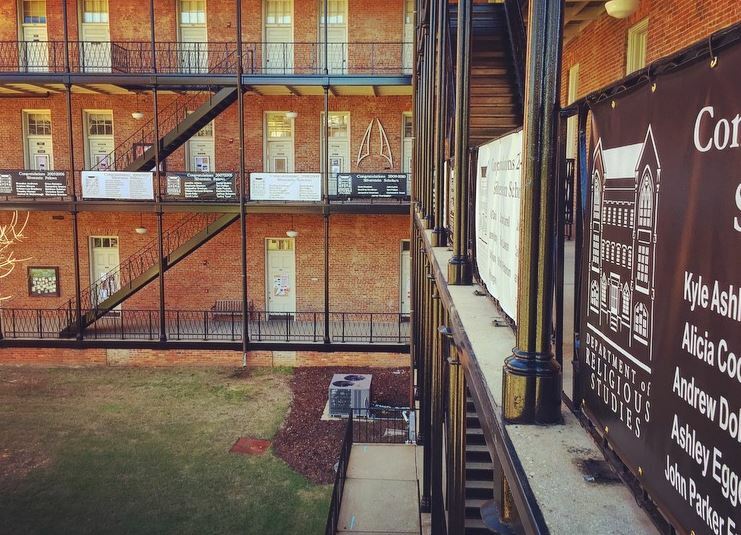 In the coming week we’ll probably post some pics from REL’s event, held once again on the balcony. We had the GoPro camera out so who knows what we captured — maybe a movie will hit the web too. All of the students award winners were honored (by Profs. Jacobs and Ramey) and then, as usual, the tables were turned and there were a few faculty surprises too, such as presentations to: Profs. Jacobs and Ramey (for 15 and 10 years of service, respectively); Prof. Ikeuchi (marking her first year in the Department [a tradition we’ve had for many years]), and Prof. Finnegan (who is heading back east to pursue her career). For Honors Day is a time to mark transitions. That makes it a ritual. And scholars of religion know a thing or two about rituals. 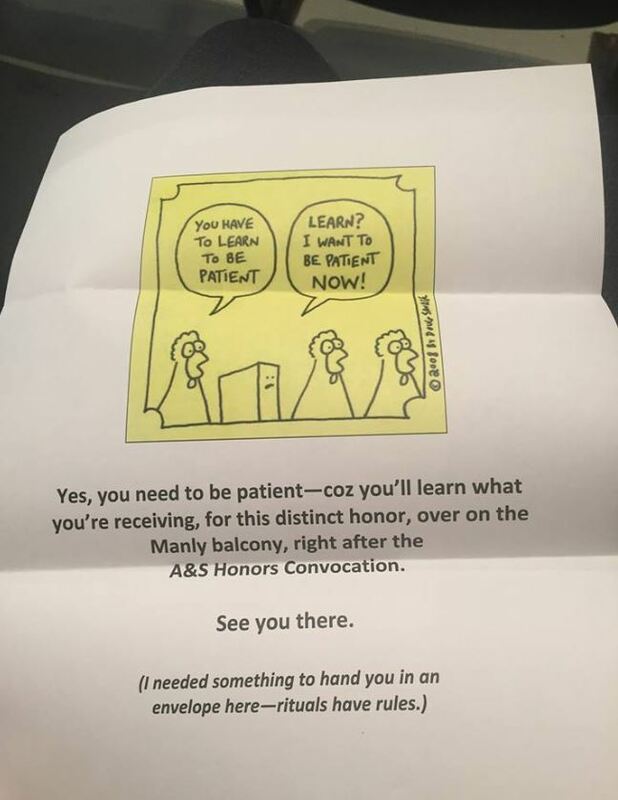 So, with that in mind, did you ever wonder what’s in that envelope the award winners receive when they come up on the stage during the A&S event? This entry was posted in Faculty Blog, Relevance of Humanities, Religion in Culture and tagged Honors Day 2017, Rite of Passage, Ritual by Russell McCutcheon. Bookmark the permalink.